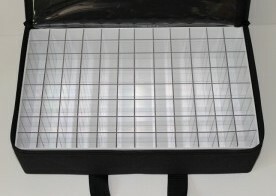 45 vertical compartments; 4″ deep. This is a smaller version of our Model #964. Designed to store crankbaits such as: Salmo Hornets, #7 Shad Raps, CD 5 Wally Divers, 1/5 oz Thin Fins, 1/4 oz Hot n’ Tots, #7 Countdown Rapalas, Shallow Little Rippers. 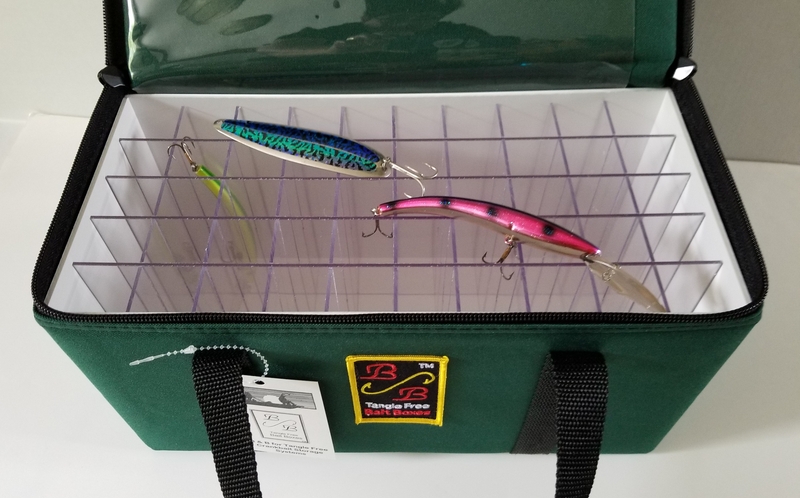 96 vertical compartments, 4″ deep, designed to store smaller crankbaits such as: 300 Series Bandit, Arkie 350 Series, F4 Salmo Hornets, #7 Shad Raps, CD 5 Wally Divers, 1/5 oz Thin Fins, 1/4 oz Hot n’ Tots, #7 Countdown Rapalas, Shallow Little Rippers, #5 and #7 Flicker Shads. Inside vinyl map pocket on cover. 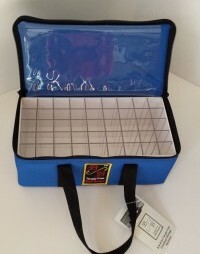 160 vertical compartments, designed to store baits such as: Salmo Hornets, #7 Shad Raps, CD5 Wally Divers, #7 Countdown Rapalas, Shallow Little Rippers, 1/4 oz. Hot n’ Tots, #5 and #7 Flicker Shads. 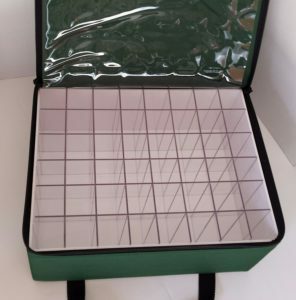 Has inside vinyl map pocket on cover. 48 compartments, 5″ deep, accommodates larger Risto Raps, Bombers, Fat Raps, #8 and #9 Shad Raps, Large Lightening Shads. Inside vinyl map pocket on cover. 80 vertical compartments, 5″ deep, designed to store most mid-size lures such as: #9 Shad Rap, #13 Rapala, Deep Little Ripper, DJ Thunderstick, CD 7 Wally Diver, #9 Tail Dancer. Inside vinyl map pocket on cover. Individually stored I can hold 32 lures or spoons. I’ll store up to a #14 Husky Jerk, #9 Shad Rap, #13 Rapala, #7 Flicker Minnow. Capable of holding the same crankbaits and spoons as the Model #966 and #646. Perfect size to take with you when you need some of your favorite baits. There are vertical compartments for 64 crankbaits and a 5 1/2″ open storage on one end for extra line, hooks, reel, scale, etc… Inside vinyl map pocket. 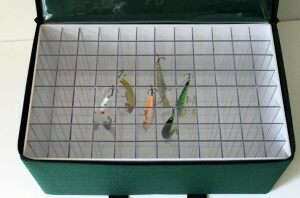 Capable of holding the same baits as the Model #326 and Model #966. 96 vertical compartments, 6″ deep. Great for Shallow Rattlin’ Rogues, Ripsticks, #13 Rapalas, #14 Husky Jerks, #7 Flicker Minnwos, AJ and DJ Thundersticks, 30 Series Rebel FasTracs, and most Trout and Salmon Spoons. Inside vinyl map pocket. 7″ deep, designed to easily store 800 series Reef Runners, Magnum Spoons, #9 and #11 Flicker Minnows, Deep Rogues, Deep Husky Jerks, Deep Walleye Bandits, Mann’s 20+ 30+ and Poe’s 400. The cover has an inside vinyl map pocket. 96 vertical compartments, 7″ deep, designed to easily store 800 Series Reef Runners, #9 and #11 Flicker Minnows, Deep Walleye Bandits, Deep Husky Jerks, Deep Rattlin’ Rogues, #18 Rapalas. Mann’s 20+ 30+ and Poe’s 400. The cover has an inside vinyl map pocket. 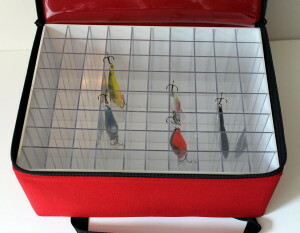 There are vertical compartments for 56 crankbaits and storage for crawler harnesses or rigs. 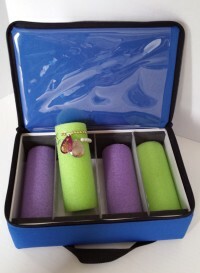 Each included tube is approximately 7″ long and can easily hold six rigs per tube. 40 vertical compartments 10″ deep, perfect for small to medium sized musky lures. 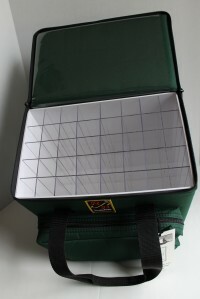 Outside zippered front pocket, large enough to fit a #3600 Plano (not included.) Inside vinyl map pocket on cover. 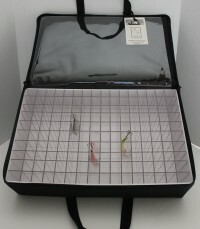 Model #192-4×6 is a box capable of individually storing 192 lures. The back to back design (two sided) allows you to carry a large number of crankbaits tangle free in one box. 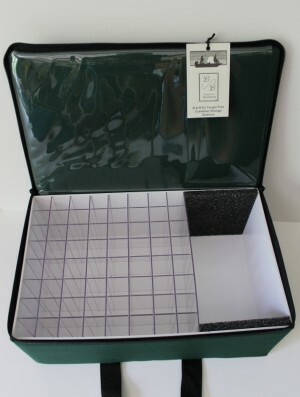 A vinyl map pocket is located on the inside cover of each side. 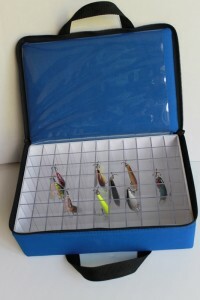 An ideal box for guides, charter captains, and tournament fishermen that need a large selection of lures, easily accessible, in a compact storage system. 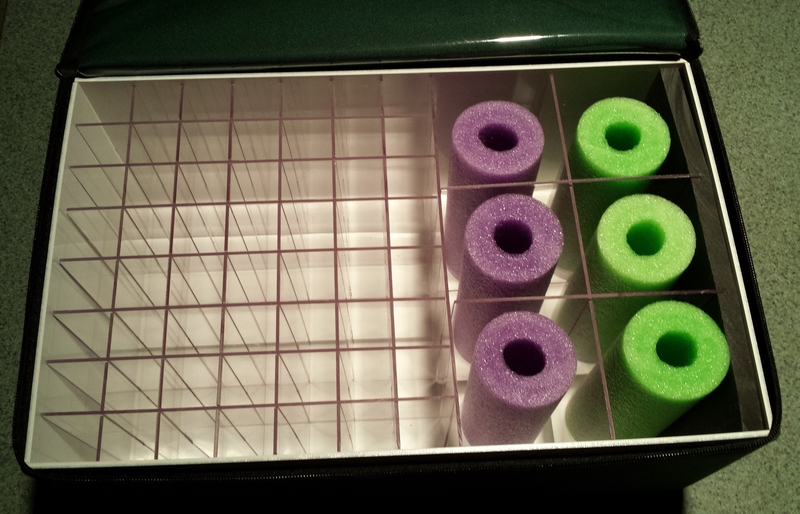 The 4″ deep side of the back to back box has two options. 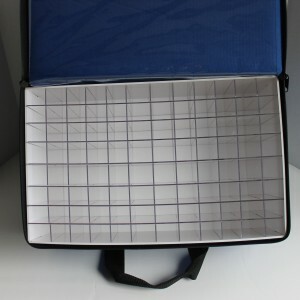 The grid can have 96 compartments or 160 compartments. 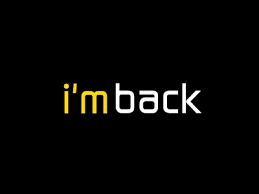 If the 160 grid is desired an additional $10 must be added to the above 192-4×6 price and $20 additional on to the 192-4×4 price. Four – 2.25″ diameter 7″ long foam tubes. Each tube holds approximately 8 pre-tied rigs (harnesses- snells-leaders.) Inside vinyl map pocket on cover. 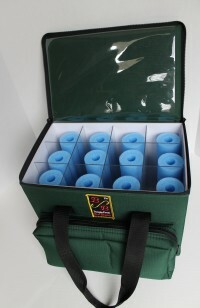 Nine – 2.25″ diameter 10″ long foam tubes, with a 2.5″ open storage on each side of tube storage. The open storage areas are capable of holding a #2-3705 Plano (not included.) Each foam tube holds approx 10 pre-tied rigs. Model also has an outside zippered front pocket and an inside vinyl map pocket on cover. Twelve – 2.25″ diameter 10″ long foam tubes. 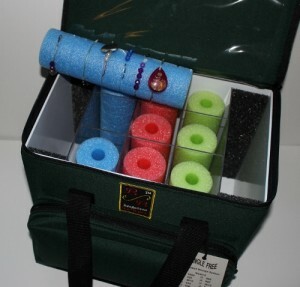 Each foam tube holds approx 10 pre-tied rigs. 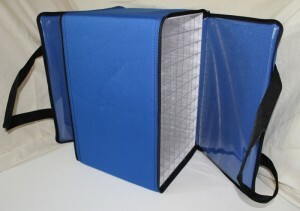 Model also has an outside zippered front pocket and an inside vinyl map pocket on cover. 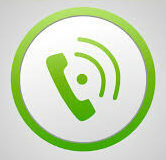 will be the SHIPPING COST based on weight of shipment and the destination zip code. 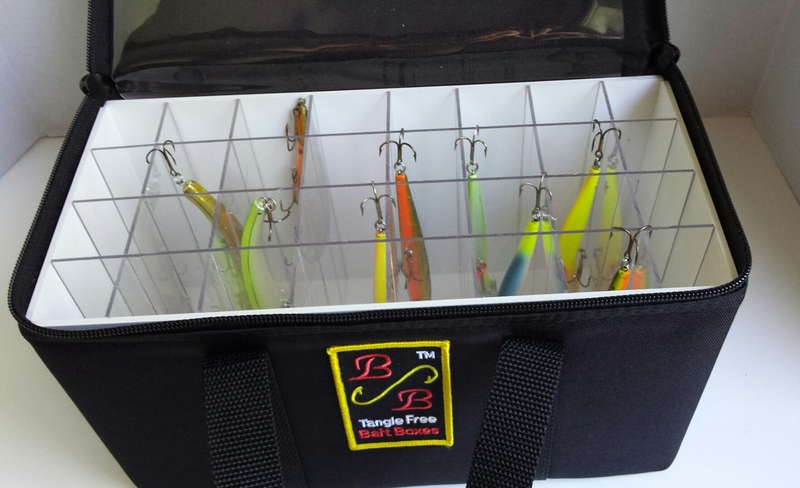 Copyright © 2015 B & B Tangle Free Bait Boxes - Walleye and Musky Fishing Tackle Boxes from B & B Bait Boxes Crankbait Storage Systems.